Edward Hopper has been a favorite painter of mine for many years now. 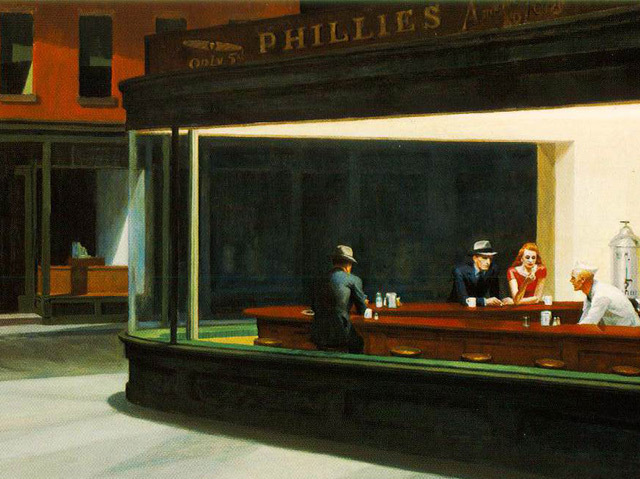 Nighthawks was the first work of his I was introduced to. Upon my first viewing, I was immediately drawn its existential loneliness: the sense that we are ultimately alone in the face of reality. In the painting, when we look at the flourescent-lit café situated in the dark New York Street, we expect it to be welcoming, but it is not. There is no entrance, no door. The extreme brightness of the interior makes the people inside seem held, exposed and vulnerable. They are hunched over in a defensive position and no one seems to be aware of each other’s presence (with the exception of the bartender). The painting portrays the three customers to being lost in their own private thoughts. Such moments of reflection place the scene outside narrative time and space, putting the viewer in a voyeuristic position. As a response to this painting, I decided to create my own musical interpretation of the work. Both the cello and orchestra are treated as a duo, presenting themselves as equal partners. The thematic material is kept very simple and sparse, giving the performer enough flexibility to express the desolation and loneliness that is felt in the painting. Various extended techniques are employed to connect the audience to elements that lie outside musical realms (eg. gusts of wind, distant rustlings, etc). For cello and orchestra version, order score and parts here. For cello and piano version, order score and parts here.